When Nikolaj Kunsthal on June 30 opens its doors to the old church tower, it also opens to one of Copenhagen’s most spectacular vantage points with art at a height of 35 metres. The opening exhibition has been curated by Nikolaj Kunsthal in collaboration with the culture lab Prxjects by Mercedes-Benz and has been created by Danish artist Tommy Støckel. The stock exchange Børsen, the Danish parliament Christiansborg, the pedestrian street Strøget and Gammel Strand are some of the sights to be seen from above when Nikolaj Kunsthal on June 30 opens on a permanent basis to the old church tower from 1591. At the same time, Nikolaj Kunsthal, in collaboration with the culture lab Prxjects by Mercedes-Benz, will bring contemporary art into focus by creating Copenhagen’s tallest exhibition space at a height of 35 metres. 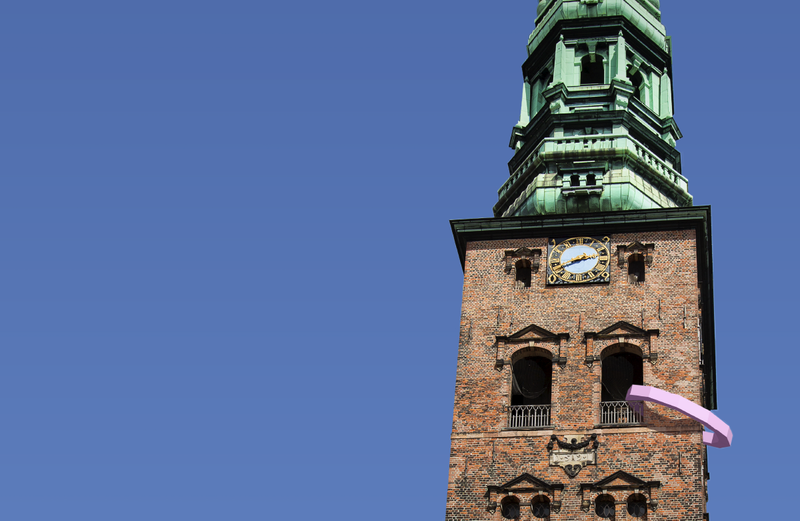 From Christiansborg, Amagertorv and other central city spots, Copenhageners and tourists will be able to see a large pink ring hanging from the Nikolaj Kunsthal tower, and tower guests will experience art with the Copenhagen skyline as a backdrop. The ring outside the tower is just one of many sculptures created by Danish artist Tommy Støckel (b. 1972) for this opening exhibition which has come into being in collaboration with the culture lab Prxjects by Mercedes-Benz. On the way up through the tower other sculptures can be seen, inspired by the building’s historical elements such as the angular shapes of the tower spire, the mechanical part of the clockwork and the time ball that was placed on the tower top from 1868 to 1909. Støckel works with modern building materials such as the colourful polystyrene insulating plates that he cuts up and reassembles as sculptures resembling digital figures. Thus a contrast occurs between the sculptures and the physical and historical surroundings. In other words: Tommy Støckel’s exhibition must be experienced both from the inside and the outside. There will be guided tours of the tower every 45 minutes, lasting some 25 minutes. Buy your ticket here or at the counter. Opening hours: Daily tours of Nikolaj Tower during exhibition periods every 45 minutes starting at 12.30 (11.30 in the weekends). Times: 7 daily tours during exhibition periods. Nikolaj Kunsthal slår dørene op til det gamle kirketårn d. 30. juni, og åbner en af Københavns bedste udsigtsposter med kunst i 35 meters højde.